Many undergraduate texts treat macroeconomics as a set of distinct topics rather than as a unified body of theory and empirical findings. 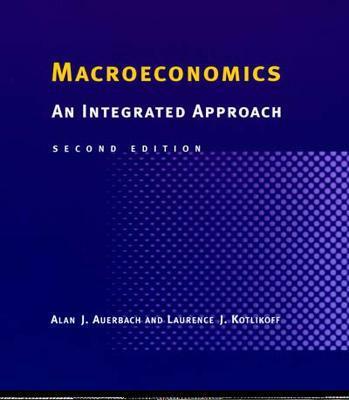 In contrast, this text by Alan Auerbach and Laurence Kotlikoff uses a single analytic framework-the two-period life-cycle model-to explore and connect each of the major issues in contemporary macroeconomics. The model describes the evolution of the economy over time in terms of the behavior of overlapping generations of individuals, each of whom lives for two periods: youth and old age. This versatile framework can encompass most macroeconomic schools of thought through the alteration of key assumptions. The use of one basic model also allows the authors to explore important topics not always addressed adequately in other texts; these include credit constraints, real business cycles, generational accounting, and international capital flows markets. Laurence J. Kotlikoff, one of the nation's leading experts on fiscal policy, national saving, and personal finance and a columnist for Bloomberg, is Professor of Economics at Boston University. His writings and views appear in Forbes, the Economist, the Financial Times, the Wall Street Journal, the New York Times, and other leading media outlets.